Noninvasive body sculpting and fat reduction. 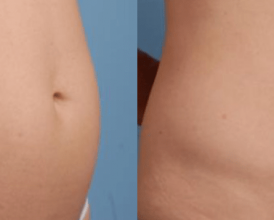 Are you searching for a convenient, effective way to reduce your excess body fat without the trouble of liposuction? A non invasive body sculpting technology that does its work without even breaking the skin? Then you’ve come to the right place. Heller Plastic Surgery offers the revolutionary TruSculpt 3D procedure by Cutera, the foremost supplier of laser technology in the field of aesthetics. Using deep tissue heating, TruSculpt 3D allows us to shift your body fat and mold the ideal figure. Heller Plastic Surgery is thrilled to offer TruSculpt 3D to all patients in Santa Clarita and surrounding areas. Call us today to schedule your consultation. Discover the amazing transformative power of TruSculpt 3D to give you the body shape you’ve always wanted. What is the TruSculpt 3D procedure? 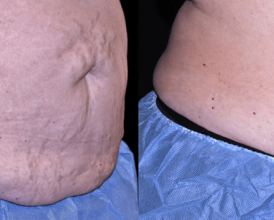 TruSculpt 3D does not require injections or incisions of any kind. All you will be asked to do is lie back in a comfortable position while your aesthetic provider runs the laser handpiece over your skin. You will feel a gentle warming sensation, as relaxing as a sauna or steam room. Even the procedure itself feels like you’re on vacation. The handpiece radiates pulses of RF, or radio, energy. Unlike damaging UV rays or microwaves, radio pulses have such a low frequency that they pass straight through the skin without damaging it. In fact, radio waves already pass harmlessly through your body all day, every day. The concentrated RF pulses from the TruSculpt 3D handpiece heat up the fat cells beneath your skin, with a sophisticated temperature control system that optimizes the heat being delivered for maximum comfort. Your skin becomes more elastic, contracting into the desired shape. The procedure is popular on the abdomen, torso, and thighs, but it is effective on any part of the body. The immediate result is tighter, firmer skin and a decreased body circumference. Just one fifteen-minute treatment session reduces the targeted fat by 25%. The procedure is so gentle and relaxing that some patients opt to repeat it several times during one hour-long visit to the office. After four weeks, dramatic results will become visible, and final fat reduction will become apparent after twelve weeks. One or two treatment sessions are usually sufficient to achieve your desired results, but feel free to repeat the treatment as often as you wish. 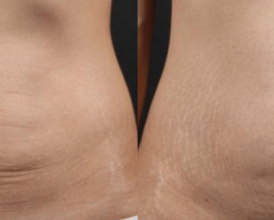 How does TruSculpt 3D differ from liposuction? Liposuction is the surgical removal of fat from your body. TruSculpt 3D is a non-invasive procedure that does not require any incisions, stitches, or anesthesia. TruSculpt 3D gently melts only targeted excess fat cells, leaving you with a sculpted, contoured look. This means that TruSculpt 3D is a simpler, easier procedure. Though liposuction produces more dramatic aesthetic changes, it is not suitable for some body areas. TruSculpt 3D can be used in conjunction with liposuction to enhance its effects or fill in those hard-to-reach places. 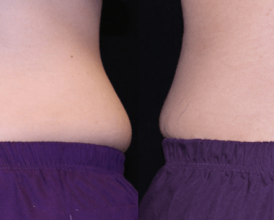 Both procedures are recommended only for contouring and small aesthetic improvements, not as a substitute for a good diet and adequate exercise. But if you’ve tried those approaches and need one final push to achieve your desired body shape, TruSculpt 3D might be just what you need.